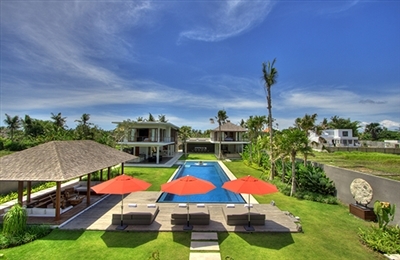 Ahhh the serenity...we enjoy coming to places out in the countryside like Villa Iskandar where you have to make your own fun. No shops, no water parks, no restaurants, no bars, certainly no other tourists, just good old fashioned self sufficiency. We walked in the rice fields, did some bird and butterfly watching, swam in the pool, explored the river bank, had massages and lay for long periods of time in the sun reading books and magazines. There were no distractions whatsoever and we loved every second. We stayed at Villa Iskandar early in the rainy season (December) and, although the sun shone most of the time, even in a torrential downpour it was magical. By around 3pm, after a morning outside by the pool working on our tans, the rain arrived with an almighty crash and a bang, like only a tropical monsoon can. And so we sat sipping cocktails, warm and dry under the cover of the dining room and watched it bucket down. We lazed about watching a couple of blockbusters on the big TV upstairs after dinner (delicious) with the volume up loud on the home cinema system. Easy peasy and lots of low energy fun. For a blockbuster of the natural variety, head down to the local beach (car and driver included) for a late afternoon walk on the deserted black sands. Sunsets and serenity never felt so good. 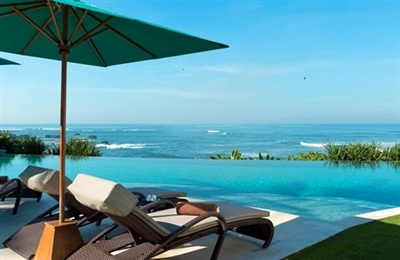 Enticing, uncomplicated and restorative; this is exactly how a beach property should be. The aesthetics of Jagaditha’s build, especially the gorgeous landscaping, felt perfectly in tune with the surroundings without cluttering or detracting from the serenity that this location brings. I loved how each bedroom enjoyed different outlooks that were equally appealing; the lily pond lapping onto three of the ground floor bedrooms was enchanting. Children especially will find lots to interest them here as there were frogs, dragonflies and fish galore, plus a flat lawn for letting off steam. A second dining area with shade-giving parasols to one side of the garden comes highly recommended for daytime dining as it beautifully overlooks the swimming pool, garden and sea and feels refreshingly informal. All outside areas come with Bose amplified sound that you can connect to your own iPod. 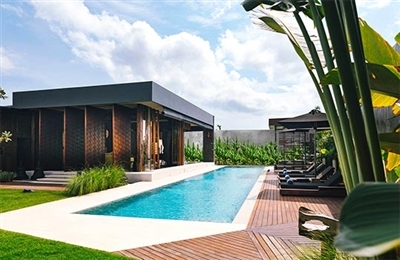 The gym comes only with a rowing machine and a Power Plate, but if you’re feeling enthusiastic Jagaditha’s guests can use the fitness centre in the nearby Canggu Club in addition to the tennis courts, creche, restaurants and swimming pools. There’s a big staff team at Jagaditha and they do a great job. Fusion cuisine is on the menu and the chef comes recommended; we really enjoyed all of our meals. Relaxing comes almost too easy at Villa Kalyani and you never get bored of doing it. From swing bed to bar stool, from poolside to pool table; if one space becomes tedious you can just decamp to the next inviting chill-out zone. The home theatre is one of the best that we have seen. With movies running through a digital projector onto a 130-inch screen, the room has surround-sound and two sofa beds wide enough to lie perpendicularly horizontal. We chose Jurassic Park to do our surroundings justice: nothing quite like a life-sized, saliva-filled set of T-Rex jaws coming at you to make you appreciate the wonders of modern technology. And there’s an even bigger screen out in the garden for special occasions! The staff are smart and have been trained to anticipate your every need; the timing of the bite-size fried bananas and ice cream brought to us poolside at sunset was impeccable. The main 22 x 6m pool has a shallow area for children at the top end and a gas fire bowl providing dramatic night-time reflections. Guest comfort has been carefully thought through, with lots of underwater pool seating so you can enjoy your G&T without having to tread water at the same time. The Pioneer Pro DJ equipment can be rented for parties at the villa. On returning to Kalyani for the first time in three years, we were very happy to note that the villa has been impeccably maintained, it has even been featured in a coffee table book called ‘The New Indonesian House’. I knew we’d be in for a treat the moment we arrived at the entrance of Villa Kayajiwa. The contemporary dark façade suggested something pretty unique and stylish would be hiding behind those walls. As a great fan of modern architecture and clever design, I could tell this villa was designed as a place to relax, entertain and impress. As far as we were concerned, it more than delivered on all three accounts. From the antique Balinese doors in the living room with door handles in the shape of a hand (door hand-le, get it?) to the original art work in every room, the owner has clearly put a lot of thought into choosing ornaments that each tell their own story. 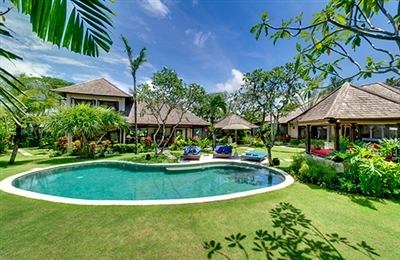 The villa is shaped around a large lawn and a beautiful 25-metre pool which flows into a spacious Jacuzzi, all providing the perfect backdrop for endless sunbathing, evening cocktails and morning laps. The moat around the garden was one of my favourite design features. The gentle sound of running water created a sense of being in an oasis, far away from the stresses of daily life. We loved the big furnished roof terrace too. Not only is it a perfect sun trap during the day, but it also doubled up as a great spot for catching the sunset, as well as for some late-night handholding and stargazing. In fairness, the karaoke room was a little wasted on us. After about ten minutes of torture, my partner and I realised the singing was putting our relationship in jeopardy. Having said that, if karaoke is your thing or indeed if you’re a masochist, then this purpose-built room will give you an extra reason for choosing this villa. Not that you’ll need any more reasons. 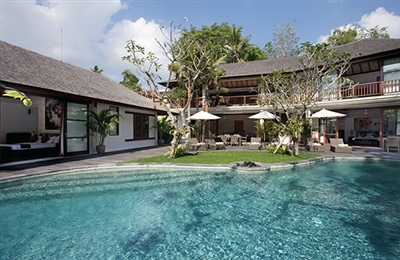 From the impressive modern design, the super helpful staff, the excellent location, this villa has incredible character and gets top marks from us.